An unapologetic, all-out action movie, Olympus Has Fallen updates the Die Hard premise for the modern, nothing-is-impossible age of terrorism, and succeeds in delivering a slick thrill ride. 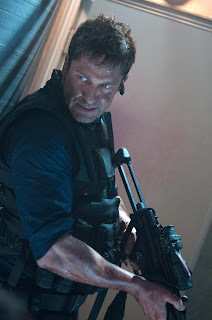 Mike Banning (Gerard Butler) is a Secret Service agent in charge of protecting United States President Ben Asher (Aaron Eckhart) and his family. Banning and Asher share a long-standing friendship and mutual respect, and the President's son Connor idolizes the Secret Service man. But when an unexpected snow storm near Camp David triggers a severe road accident that devastates the presidential motorcade, Banning saves the life of the President but is unable to rescue the First Lady (Ashley Judd). Emotionally crushed, he is reassigned away from the White House and to a menial position at the Treasury Department. Eighteen months later, and during a visit of the South Korean Prime Minister, hordes of North Korean terrorists storm the White House in an audacious attack, overcoming all the building's defences in a rudimentary but effective aerial and ground assault. From the nearby Treasury building Banning witnesses the attack unfolding and manages to fight his way into the building. The terrorists seize Asher and members of his cabinet as hostages in the White House bunker. The ruthless terrorist leader Kang (Rick Yune) methodically starts to kill his hostages and makes far-reaching demands on Interim President and Speaker of the House Allan Trumbull (Morgan Freeman), while extracting crucial nuclear warhead codes from the captive cabinet members. Totally isolated but intimately familiar with the White House layout, Banning begins a stealthy one-man counter-attack that may prove to be the only hope for rescuing the President and avoiding a major global war. Olympus Has Fallen is loud, ultra-violent, hyper-kinetic, and filled with colourful expletives. Director Antoine Fuqua (most famous for 2001's Training Day) sets the pace early with the motorcade accident set piece, and never lifts his foot off the accelerator. The prolonged attack sequence, with the terrorists unleashing one surprise after another to systemically overpower the defences of the White House, is breathlessly exciting. And it is only far-fetched in a world where it would be absolutely impossible for terrorists to, say, knock-down two World Trade Centre buildings and destroy a large part of the Pentagon on the same morning. Even once the movie settles into the familiar Die Hard rhythm, with the isolated Banning gathering the pieces and finding ways to gain the psychological edge on the terrorists, Olympus Has Fallen maintains its manic intensity. There are never more than a fistful of minutes between each neck-cracking encounter or bullet-rich battle, as the rugged Butler proves a more than capable and charismatic echo of Bruce Willis, cracking one-liners when needed but mostly just using his wits to try and overcome an overwhelming numerical and logistical disadvantage. Eckhart makes for a believable if standard President, while Melissa Leo gets to be not only the first female Secretary of Defence, but also the first Secretary of Defence tortured by terrorists in the White House bunker. Rick Yune is perfectly calculating and quite despicable as Kang, a man who never quite got over the death of his mother and wants the whole world to pay in spectacular fashion. With the White House half in ruins and fully in enemy hands, over at the Pentagon Angela Bassett as the head of the Secret Service and Robert Forster as an Army General join Freeman's reluctant Interim President to create a weighty table of panic. They are generally helpless as Kang turns the screws with outlandish but deadly serious demands to immediately withdraw US forces from South Korea. The strong supporting cast enhances Olympus Has Fallen with continued interest in every corner, and provides Butler with capable relief, allowing Fuqua to train his cameras in other directions with confidence. Olympus Has Fallen defines its clear and honest objective to provide an overdose of spectacular action, and delivers with a comprehensive bang.